FCP5 then allows the creation of Multi-cam packages containing all the multi-cam video and multichannel sound into a single easy to cut masterclip where all camera angles and all sound channels are instantly available to an editor cutting the story. After cutting, an XML export from FCP is passed via XMLPro into a Pro Tools session for audio post production, maintaining links back to the original BWF files recorded with Metacorder and with any volume automation added by the picture editor intact. Picture post also exports a QuickTime reference movie for the Pro Tools editor to work against, using VirtualVTR connected to Pro Tools (not shown on the diagram). This workflow offers fantastically low production costs, teamed with a very, very smooth no-compromise workflow offering the editor rich creative, instant access to all cameras and all sound, with easy turnover to audio post. All picture and sound elements can be linked directly back to the initial first generation sources all the way to the final cut, so duplication and abstraction of media is completely eliminated. This diagram shows the workflow which was employed on the project 'The Agency' - it brings together various elements of Gallery's TV Production strategy for Final Cut Pro. The DV tapes are logged and captured with FCP, and after capturing with the (incorrect) DV Tape timecode, all the clips are batch processed with TimeTools, a new app from Gallery. 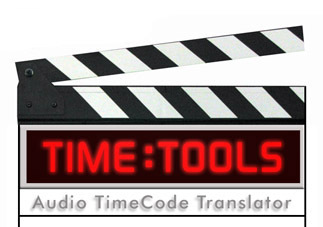 TimeTools reads the LTC from channel 2 of the movies, and turns this into an accurate Timestamp for the clip, which will perfectly match the 16 channel audio masterclip from Metacorder.